The past few months have seen a consistent reduction of risks in the US stock market. That has changed over the past week, and volatility is back with a vengeance today. The Dow Jones fell 823 points, the 3rd largest point decline in history. The two largest declines occurred in February. Risks have once again increased, and the character of the market may have changed today. It is not a foregone conclusion that the market will see a period of volatility like what happened in February, but the likelihood of that is much higher today than last week. The important “tell” will be how the market behaves once it has an inevitable bounce from these oversold levels. Fortunately, for IronBridge clients, our proprietary models shifted portfolios into a more defensive mode last week, and as a result risk was reduced by nearly a third of what it was a couple weeks ago. We cannot stress enough that the most important part of an investor’s toolkit is having an unbiased, repeatable process that can adapt to changing conditions. The news outlets will blame higher interest rates, but we do not think that is the culprit. In fact, interest rates were little changed today. The fact is, interest rates have been steadily moving higher since August. And all of a sudden it matters today? Not last week, or two weeks ago? Today, when interest rates were little changed? Instead, we believe the culprit for the selloff was weakness under the surface of the market. Five stocks (or 1% out of 500) were responsible for an amazing 60% of the return for the S&P 500 Index this year. 48% of S&P 500 stocks are in a bear market, as measured by being below their 200-day moving average. 60% of all NYSE stocks are in a bear market. NYSE stocks represent more than 2000 companies, or all of the stocks traded on the New York Stock Exchange. So we have a situation were 1% of the index was responsible for a majority of the rise, while half of the index is showing tremendous weakness. The simple fact is the foundation of the stock market appears weak. We are not suggesting the economy is weak, or that stocks cannot move higher from here. But there is no question in our mind that the underlying base of the stock market is simply weak. And when selling occurs, prices can decline in a hurry. Markets tends to have some sort of “follow-through”, meaning slightly lower prices are likely in the coming days. The follow-through declines occur more slowly. In other words, prices are marginally lower, but do not occur as quickly with such violence. Divergences occur. Selling pressure abates, and some degree of order returns. A bounce happens, and prices recover at least some of the decline. Prices move into a “Resistance Zone”, where the real battle between bulls and bears takes place. The trend appears. Either the previous uptrend reasserts itself, or we see a trend change into a weaker market. However, in some cases, the decline accelerates. This happened in early February of this year. From a statistical standpoint, this is a much more rare occurrence, but the potential damage from such a “crash” is much higher. In the chart below, we point out a few key areas. First, the market had been rising in a very well-defined trend channel since last spring, noted by the two blue parallel lines. 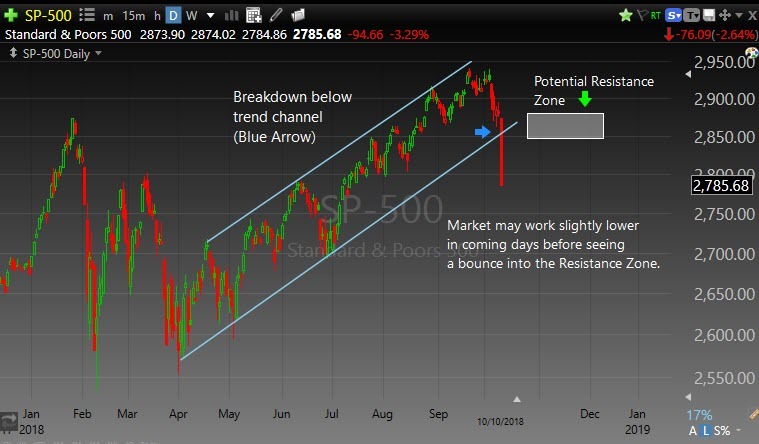 Yesterday, the market tested the lower-end of the trend channel. This is very typical. This morning, the trendline was broken, and sellers came out with a vengeance. The important part now is to see if and when a bounce occurs, and most importantly how the market reacts following a bounce. The bond market had been showing signs of stress for most of the past two years. This stress has accelerated in the past 6 weeks, but higher rates are no surprise. Fixed income actually appears to moving into a more favorable position in our investment signals, and we would not be surprised to add longer dated bonds back into client portfolios in the coming weeks. We are taking a prudent and disciplined approach to this period of volatility. We hope the market continues to move higher, and hope we get signals to increase client exposure to risk. But as we’ve said before, hope is not an investment strategy. We continue to monitor our market signals closely, and are prepared to both increase or decrease risk as warranted. Disclaimer This presentation is for informational purposes only. All opinions and estimates constitute our judgment as of the date of this communication and are subject to change without notice. > Neither the information provided nor any opinion expressed constitutes a solicitation for the purchase or sale of any security. The investments and investment strategies identified herein may not be suitable for all investors. The appropriateness of a particular investment will depend upon an investor’s individual circumstances and objectives. *The information contained herein has been obtained from sources that are believed to be reliable. However, IronBridge does not independently verify the accuracy of this information and makes no representations as to its accuracy or completeness. Previous Article Previous Article: What do you See? Subscribe to our twice monthly newsletter for meaningful insights on a predictable schedule. Copyright © 2019 IronBridge Private Wealth, LLC. All rights reserved. Enjoy our Research? Please spread the word.